Hilti Corporation (Hilti Aktiengesellschaft or Hilti AG, also known as Hilti Group) is a Liechtenstein multinational company that develops, manufactures, and markets products for the construction, building maintenance, energy and manufacturing industries, mainly to the professional end-user. It concentrates mainly on anchoring systems, fire protection systems, installation systems, measuring and detection tools (such as laser levels, range meters and line lasers), power tools (such as hammer drills, demolition hammers, diamond drills, cordless electric drills, heavy angle drills, power saws) and related software and services. Hilti, a registered trademark of the various Hilti corporate entities, is the family name of the company's founders. In 1941, the Hilti company was founded by Martin and Eugen Hilti, with the opening of a mechanical workshop in Schaan, Liechtenstein. Martin Hilti was trained in mechanical engineering and automotive design at the Wismar Engineering College and was 26 at the time of founding the company. The Martin Hilti Family Trust holds all of Hilti's registered shares as of 2003. Hilti OHG began as a company that produced equipment and components on contract for the German industry during World War II. The exports went largely to Maybach Motorenbau in Friedrichshafen and Robert Bosch in Stuttgart. The products included tank parts and ammunition components for the Nazi war effort. After the war there was a sharp decline in sales and the company was close to bankruptcy. To make ends meet Martin Hilti signed sub-contracts as diverse as gray cast iron parts for the Swiss textile industry, machining eggcups molds, or lighters and pencil sharpeners. In the late 1940s Martin Hilti found a technology that would allow setting nails into concrete or masonry, and he acquired the original designs and the patents rights of what would later become Hilti's Direct Fastening first tool. Although promising, the technology proved to be immature, and required significant development. In the meantime, through the early 1950s, Hilti produced its own line of household products, which included a cigarette lighter, and a water-powered kitchen mixer called "Ello", which enjoyed considerable success. In 1952, with a solution that proved mature to be marketed, Hilti launched its first construction-related product, a manual tool to drive threaded studs into steel, and in 1953 the company introduced its first powder-actuated high-velocity fastener that allowed setting nails into concrete, called Perfix. At this time Hilti opened own offices in Italy, Belgium, Poland, Finland, Norway, Germany, Denmark, the Netherlands, Portugal, Austria, France, Australia, Canada and the USA. In 1963 Hilti was present in 23 countries, with a turnover of over 400 million Swiss francs. In 1964 Hilti started marketing a drill that also had a chiselling function, made by the Kocher Company, in Basel, under the name "Torna 765". After receiving customer feedback Hilti started a product development and improvement project under the name "Torna Entwicklung" (German for "Torna Development"), or "TE" for short, which has since then become the standard name for all Hilti electropneumatic tools. In 1967 the company introduced the TE17, a fully electropneumatic rotary hammer drill which featured a safety clutch, and it was shipped to customers in Hilti's first distinctive red toolbox. The global expansion continued throughout the 1960s and by 1971, Hilti's global turnover was 376 million Swiss francs across 45 countries, including new production facilities in Austria and in Germany. In 1974 Hilti started to develop and market anchor bolts, and in 1977 Hilti introduced its first chemical anchor product line. Two more production facilities were opened, a plastic manufacturing plant in Germany purchased in 1975 and a plant in England acquired in 1978. In 1979 the company opened another production facility in Tulsa, Oklahoma, USA, to produce anchors. During the 1980s Hilti formed market region centers for America, Europe, Africa and Asia, to improve the proximity to their customers. As of 2019, Hilti has offices in 120 different countries, 29,000 employees and sales of over 5 billion Swiss francs. Hilti is based in Schaan, Liechtenstein, and is the principality's largest employer. The company employs more than 28,000 people worldwide. Hilti has over 3,000 employees in the United States. HNA's headquarters had been located in Tulsa, Oklahoma, since 1979, although it has employees in all fifty states. It moved its North American headquarters from Tulsa to Plano, Texas, by June 2015 and opened a research and development center in Irving, Texas. HNA developed an employee corporate culture that was later adopted by the entire company worldwide. Employees who are hired are put through a Basic Training Seminar in Tulsa for four weeks, and on a yearly basis employees complete a survey called GEOS (Global Employee Opinion Survey) in which they give feedback about the company. 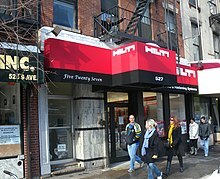 Hilti Northern Europe is headquartered in the Hilti Limited office in Manchester, Great Britain. The Hilti (Gt. Britain) office oversees a staff of over 1000 team members in varying roles such as sales, engineering, marketing, finance, HR, IT, procurement and customer services. Hilti India is headquartered in the Hilti India Pvt Ltd office in Gurugram, Haryana. It has started its direct operations in India in 1997. The Hilti India Pvt Ltd office oversees a staff of over 800 team members in varying roles such as sales, engineering, marketing, finance, HR, IT, procurement and customer services. They have their stores in 23 major cities across India. ^ a b "Hilti Company Profile". Hilti corporate website. Retrieved 25 October 2018. ^ "Hilti Corporate website". Hilti Group. Retrieved 25 October 2018. ^ "History of Hilti AG – FundingUniverse". www.fundinguniverse.com. ^ "Liechtensteinische Produktion für die Wehrmacht - NZZ". 1 April 2006 – via NZZ. ^ Hilti Corporation (September 2016). Ready for the future. Schaan, Liechtenstein: BVD Verlag + Druck. p. 19. ^ Peter Geiger et al. : Frage zu Liechtenstein in der NS-Zeit und im Zweiten Weltkrieg: Flüchtlinge, Vermögenswerte, Kunst Rüstungsproduktion. Vaduz, Zürich 2005. ^ Hilti Corporation (September 2016). Ready for the future. Schaan, Liechtenstein: BVD Verlag + Druck. p. 21. ^ Hilti Corporation (September 2016). Ready for the future. Schaan, Liechtenstein: BVD Verlag + Druck. p. 43. ^ Kyle Arnold, "Turning 30 rocks at Hilti", Tulsa World, August 8, 2009. ^ Wendy Hundley, "Tulsa-based manufacturer to move headquarters to Plano", Dallas Morning News, October 14, 2014. 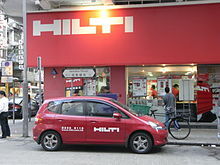 Wikimedia Commons has media related to Hilti Group.